World Chess Champion Magnus Carlsen had a long day on Monday. First he was in Manchester, England, where Kaspersky Lab sponsored an exhibition game against Liverpool footballer Trent Alexander-Arnold. A somewhat gruesome encounter ended in a nice pure mate on move 17. Then he caught a flight to Hamburg, Germany to play against users of his Play Magnus app in the annual Play Live Challenge. Again he was taking no prisoners, as he needed just half of his 30 minutes to complete a clean sweep of the opposition. When Liverpool manager Jürgen Klopp kept attacking right back Trent Alexander-Arnold on the bench for the top-of-the-table clash with Manchester City on Sunday, pundits assumed it was because he wanted his team to play more solidly against dangerous opposition. 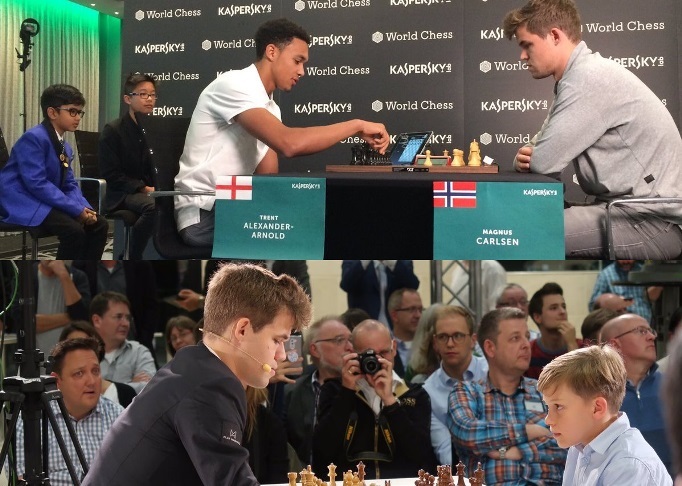 Perhaps, however, it was to save the 20-year-old England international for the big game on Monday… against Magnus Carlsen! Trent Alexander-Arnold wasn’t given a rook, but time odds, with 5 minutes to his opponent’s 1. He was also given two helpers in the form of English chess prodigies Shreyas Royal (9) and Kyan Bui (12), who were able to suggest moves during the game. And, as if that wasn’t enough, he was supposed to get extra info from eye-monitoring technology provided by 4tiitoo, that would give him advance warning of what Magnus was planning. And secondly, that Trent had lasted 8 moves longer than Bill Gates did in a similar time odds game. You can find Jan Gustafsson’s deep analysis of that game here. It was a great game, Trent's good. He has a bit to learn but he definitely has talent. Football and chess can seem like sporting polar opposites, but there are so many similarities with the modern game. Technology is playing an increasingly important role in the life of a footballer and I guess that is true across most sports now. There wasn’t much time to hang around for Magnus, since he had a flight to catch to Hamburg for the Play Live Challenge. Actually if you wanted a headline for that game it could be, “World Champion misses mate-in-1!”, though mate-in-2 and a win in 22 moves got the job done. After 20…Nd3! “probably it’s quite good for White, but to prove it is difficult with 11 others games and the clock ticking”, but instead 20…Bxe7? 21.Qxe7 Ra7 22.Nh6+! and Black resigned with mate next move. There are many good things about chess… winning is just part of the fun - I wouldn’t say it’s the main motivation! It’s an opening that I’ve only played twice, this game and the last game against Karjakin in the World Championship match! If Christoph had retreated his c5-knight here Magnus admitted he had no clear path to victory, but instead 27…Kf7? 28.Nxa5! dropped a pawn, when the rest was predictable. Magnus found time to offend 67 million Frenchmen, but it’s likely his quip was targeted at no more than a couple! As we mentioned at the beginning, we’ll next get to see Magnus in action in the European Club Cup, which starts this Friday. The line-up features 18 2700 players! No. Name Rtg FED Team Bo.